Weeknight meals are awfully quick around here. As fast as I can bring a pot of water to a boil and cook some Japanese noodles (about five minutes), dinner is more or less served. 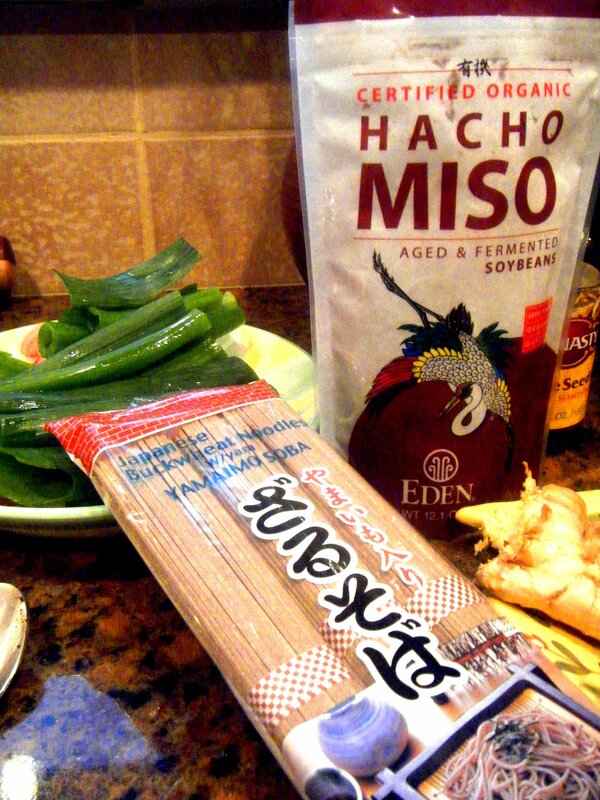 Start thinking about beefing up the East Asian section your spice cabinet (that may already contain some soy sauce) to also include a bit of miso, a small bottle of fish sauce and some mirin (a rice wine). If you’ve got these three elixirs at the ready, a salmon dinner for three can be yours for under 10 bucks and on the table in under 15 minutes. Bring a large pot of water to a boil. 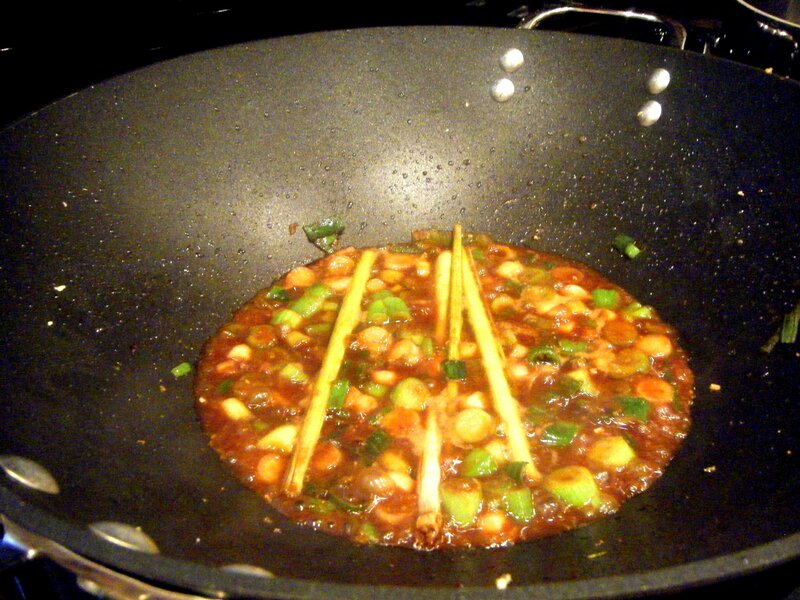 Heat a wok on high heat. 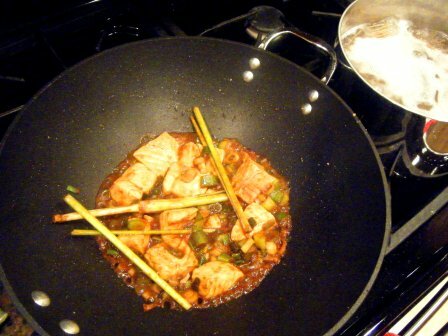 Add in a tablespoon of vegetable oil, a dash of sesame oil, a heaping teaspoon of miso, 1/4 cup of water, a splash of mirin, a couple shakes of fish sauce, a stalk of fresh lemon grass (that’s been bashed repeatedly with the back of a knife, and, incidently, comes in at a whopping five cents at Whole Foods) and 15 grates (on a fine grater or microplane) of fresh ginger (a healthy bulb of which, by the way, should set you back about 60 cents). Add in the thinly sliced white parts of a bundle of green onions (locally grown and about 50 cents, but whatever). Slice in two and set aside the remaining green tops. Simmer this together for five minutes or so, whisking briskly to break up and liquefy the miso. 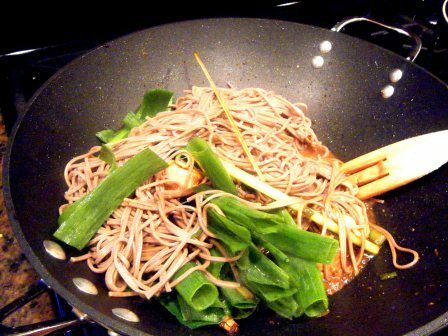 When the water has come to a boil, add in two bundles of buckwheat miso noodles to the water; cook for five minutes. 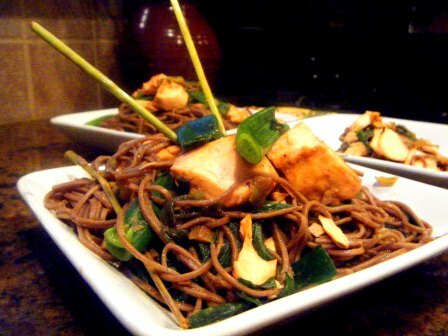 While the noodles are cooking, add in 2/3 to 3/4 of a pound of salmon that has been cut into very large chunks to the miso mixture. Cook over medium high heat for approximately five minutes. Drain the noodles and rinse. Add into the salmon and miso, along with the reserved spring onion tops. Drizzle generously with soy sauce. Mix gently with tongs to incorporate, cook for two minutes or until the onions are wilted. Serve piping hot. Playlist included Bang Bang Bang, by Mark Ronson and The Business Intl. Please come to my house and make this for me for dinner. See you at 7. Looks amazing PK! You bring the jam and cheese!